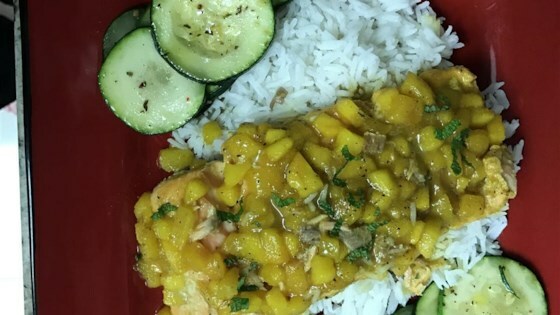 "This salmon steak is grilled with a sweet, simple peach sauce. It can also be baked." Stir together the peaches, honey, and curry powder in a small saucepan over medium heat. Bring to a simmer, and cook until the peaches break down, and the sauce thickens, about 10 minutes. Season to taste with salt and pepper. Season the salmon steaks with salt and pepper, and cook on the preheated grill until the fish flakes easily with a fork, 5 to 10 minutes per side depending on the thickness of the steaks. Pour the peach sauce over the salmon to serve. This recipe was really tasty! We had some pineapple on hand and added that to the sauce and it turned out great! This recipe was absolutely delicious and incredibly quick and easy to make. I will definitely be making again. Might also try with mango. My Boyfriend and I loved this recipe! It was so good. I made it again with Chicken instead of Salmon and it was still just as good! Served with Rice is best. So simple and very flavorful. I used more curry than called for and used "Chunky Peach Spread" from this website. Very good with a side of rice and some asparagus.